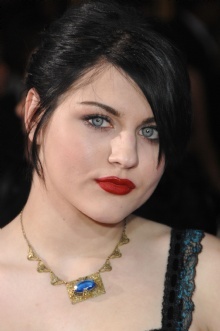 Frances Bean Cobain is a famous Celebrity from USA, she is 26 years old and still alive, born August 18, 1992. She is the daughter of Courtney Michelle Love (lead vocalist, lyricist, and rhythm guitarist for alternative rock band Hole) and Kurt Donald Cobain (best known as the lead singer and guitarist of the grunge band Nirvana). Frances has had a dramatic childhood, first with his father's death in 1994, and then with his mother's violent drug abuse. Courtney Love has been in court several times, because the authorities have doubted her abilities as a mother. She is born under the zodiac leo, who is known for Ruling, Warmth, Generosity, Faithful, Initiative. Our collection contains 4 quotes who is written / told by Frances. "My look is a Modern Bohemian type thing"
"I'm a different person. I don't want to be titled as Courtney Love and Kurt Cobain's daughter. I want to be thought of as Frances Cobain"
"I have 137 pairs of shoes and 200 pairs of jeans"
"I don't like to look sloppy. I'm a girly-girl"